Eggnog is a backbone of the Christmas season. For just those few days this drink will form one of the staples of your diet. If you’re tired of the same old blends you get from the cartons, it’s time to look at something you can do at home. These five eggnog recipes will make this drink a Christmas favorite for you and all the family. Who said you couldn’t have eggnog for breakfast? The eggnog fresh toast bake is a breakfast you can make-ahead for both you and your friends. What we love about this recipe is it’s not a heavy breakfast and it’s incredibly nutritional. For some extra flavors, you can even add some fresh fruit on top. Eggnog is commonly considered to be a family-friendly drink, but if you want to repurpose it you can. Baltimore eggnog is a special alcoholic drink that can be unveiled at any festive party. It contains eggnog, Jamaican dark rum, brandy, and madeira. Shake it all together with a few other embellishments and you’ll have an eggnog that’s for those over the age of 21. Depending on how you like it, just adjust the amount of alcohol and the amount of eggnog you put in. Chocolate eggnog milkshake is probably the easiest recipe to follow on this list. It essentially just contains your usual array of milk, chocolate, and eggnog all combined. The real fun is in drizzling chocolate syrup down the inside of the glass to get that classic look from the ice cream shop. Try experimenting with some toppings, including whipped cream, sprinkles, and maybe even some maple syrup. This is perhaps the ultimate holiday hybrid. If you love Halloween and Christmas all at the same time, this is the drink for you. The spice of a pumpkin when combined with white chocolate heated creates a taste that’s truly divine. Your family are sure to love this one for heating up those cold winter nights. Eggnog is one of those substances that can be used for practically anything. All you must do to make frozen eggnog ice cream is to freeze some eggnog then let it defrost ever so slightly. Put it into an ice cream cone bought from the store and add some sprinkles and as many different sauces as you like. You’ll be delighted at how similar the texture and the feel is to ordinary ice cream, and it’s arguably a whole lot healthier. 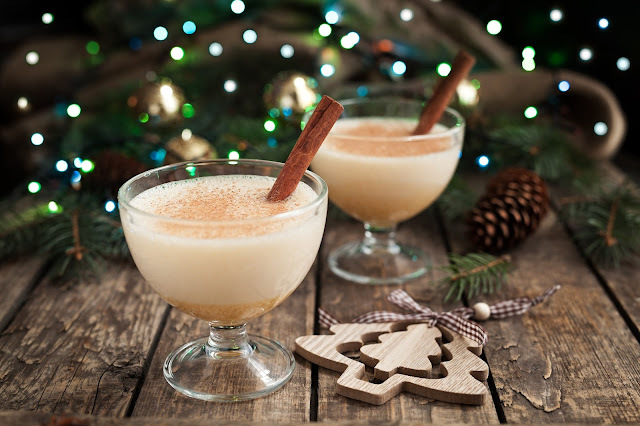 You can do so much more with eggnog than add a few ingredients to your usual drink. Many other foods can be based entirely on eggnog. If it’s dairy food, you can try experimenting with making it out of eggnog. See what you can come up with this Christmas. Which of these eggnog recipes will you try during the holiday season?